Taiba, 24, lives with her 5 brothers and 1 sister in Chitral. Currently she is one of the supervisors at the embroidery Centre in Chitral. 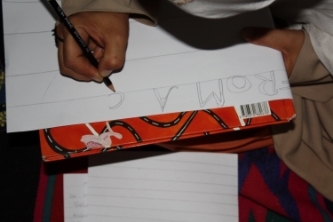 She can read broken English but was given reading and writing lessons during the workshops. Taiba feels connected to the weavers from Lewis after seeing the photographs of the tweed - making process and would like to meet them one day. Taiba has interwoven the lines from Scottish ‘Weaving Songs’ by Donald S Murray. ‘Listening to the Weaving songs has reminded me of the folk songs and stories relating to Chitrali Shu weaving and embroidery. We card the wool at night from sheep, yak and ibex …Sometimes twelve women sit together in a house and prepare the yarn for weaving into coarse woollen cloth. Nowadays the women’s role has expanded to include the work that used to be carried out by men. 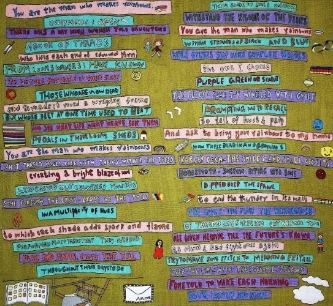 ‘At first I thought that my work was not good enough and did not take embroidery seriously as a profession. I had no self-esteem but when I read the weaving songs and saw the tweed-making process in photographs, it inspired me and encouraged me to take more pride in my work. If the Scots can make beautiful tweeds and their cloth is valued worldwide; then why not embellish the cloth with the skills of Chitrali embroiderers. During this time my confidence grew and hence my business also flourished. …It felt like being in a family during the workshops. I miss this project greatly and wish we could have an art centre in Chitral, where the women can learn and exchange creative ideas.